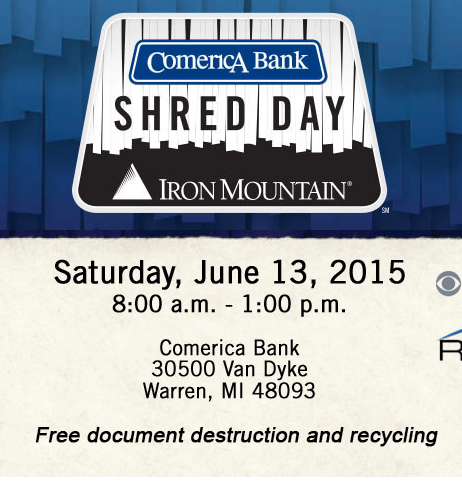 Comerica Bank, Iron Mountain Incorporated and Re-Source Partners announced they will partner to host the eighth annual community Shred Day at Comerica’s 13 Mile-Van Dyke banking center, located at 30500 Van Dyke Road in Warren from 8 a.m. to 1 p.m. on Saturday, June 13th, 2015. Shred Day is designed to help prevent metro Detroiters from becoming victims of identity theft and to raise awareness about proper recycling methods. This year’s Shred Day event will also provide consumers with the opportunity to have their small electronics recycled. Re-Source Partners will be accepting small electronics such as computer systems and accessories, handheld devices, and office equipment for recycling. Comerica is again encouraging people to give back while protecting their identity by donating nonperishable food to Gleaners Community Food Bank of Southeastern Michigan. Volunteers will be onsite collecting donations on Shred Day.